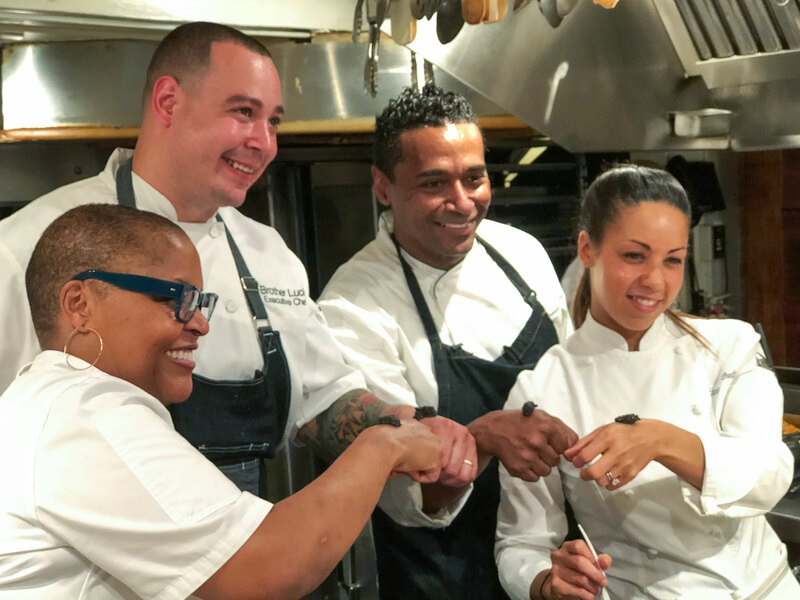 The night of June 18, former Top Chef competitors Adrienne Cheatham, Tanya Holland, Brother Luck, and Chris Scott collaborated on the first-ever Juneteenth dinner at the James Beard House. On September 22, 1862, President Abraham Lincoln signed the Emancipation Proclamation, freeing enslaved people in the United States. But while that act went into effect on January 1 of 1863, news in the mid-nineteenth century didn’t travel fast. In Texas, slavery still stood until Union Army General Gordon Granger rode to Galveston Island and informed the last remaining enslaved people of their freedom on June 19, 1865. Since then, Black communities across the United States have observed the Juneteenth holiday as a demarcation of the true end of slavery in America. As with any celebration, the day comes with traditions and significance for many Black Americans. But at the same time, it can be a day to look more deeply at the way people celebrate (if they do at all), and to highlight diversity within the Black community. Such was the case at last night’s first-ever Juneteenth celebration at the James Beard House, which brought together Adrienne Cheatham, of the Sunday Best pop-up series and formerly of Le Bernardin and Red Rooster, Tanya Holland from Oakland’s Brown Sugar Kitchen, Brother Luck of Colorado Springs’ Four by Brother Luck, and Chris Scott of Brooklyn’s Butterfunk Kitchen and Sumner’s Luncheonette (all of whom also happened to be contestants on season 15 of Top Chef). The chefs range in ages and influences, spanning all four U.S. time zones, as well as oceans. Featured on the menu were brown sugar biscuits, salmon with muffuletta dressing, uni spoonbread with buttermilk dashi, dirty rice arancini and a generations-old recipe for scrapple. We asked the chefs to share their connection to Juneteenth and how food tells both their individual and cultural stories. Food & Wine: What significance does Juneteenth hold for you? Why do you think it’s important to celebrate? Adrienne Cheatham: Growing up with a father from Mississippi, it’s a holiday that you hear about in Black communities and churches, but it’s never really recognized by any major mainstream media outlet of any sort. So to have it recognized by the James Beard House, to show the cultural and culinary contributions of African Americans is huge. It’s the first time it’s been validated by an institution like this. Tanya Holland: I don’t have any history celebrating it. The first time it was really brought to my attention was years ago. I went to Kazakhstan to represent African-American chefs and to celebrate the 150th anniversary of Juneteenth. Of course, I’d heard about it, but I hadn’t really grown up celebrating it. I didn’t celebrate Kwanzaa. My first season on Food Network they had me do a Kwanzaa story and I was like, “Uh, okay.” It wasn’t authentic to me. I think more attention should be paid to Juneteenth. It’s so significant; it’s really the big day for African Americans. And it lead to that Great Migration that lead to a lot of the food that we cook today. I think this dinner is an opportunity to be authentic to ourselves, to show who are and what we’ve done. We’re proud of our heritage, but we’re also evolving. Brother Luck: As a kid we never celebrated. I didn’t have that kind of relationship with my parents, with my father dying when I was extremely young and with my mother being incarcerated. But as an adult I’ve been on the journey of discovering who I am. I’ve had a lot of conversations with aunties and uncles, really just trying to understand “who are we.” So this is very emotional for me, doing this dinner, because it’s a level of acceptance as a biracial, mixed person that you never have. We always talk about black and white, but there are so many mixed people that don’t fit in either side, so this it’s beautiful to connect. What ingredients or dishes do you associate with Juneteenth? CS: It’s a celebration holiday, so celebration foods come into play: The fried chicken, the biscuits, the ribs, of course the macaroni salad, mac and cheese—feel-good foods. They would talk about it in church a lot. Always in a church basement they would go all out, you know that church cake— the yellow cake with the white icing and coconut on it. AC: It depends on where you are. In certain parts of the South it’s towards the crawfish season so you can do crawfish boils. In parts of Texas that I've been to around Juneteenth people do barbecues, and in Chicago where I’m from, a lot of people from Mississippi migrated up there, so there’s always a potluck of some sort that includes barbecued ribs, hot links… you don’t get good hot links in New York. There are certain things: cornbread, spoonbread, and potato salad are served as a side dish at every barbecue. BL: When you think of Juneteenth, you always thing of the South, of Texas, and you have that Creole background that comes through there, like when you get into Beaumont, TX and Houston, that flows through Louisiana and goes into New Orleans. There’s this beautiful blend of Spanish and French and Indian and African, and that flavor profile is so crazy. So as someone who has a lot of that in my blood, those are the flavors I refer to. Why did you choose the dishes you put on the menu for this dinner? AC: It’s a dish the shows evolved southern cuisine, buttermilk cornbread or buttermilk biscuits, and you pull that buttermilk out and incorporate it into the dashi and then you have the spoon bread, so you still have bacon in there, you have that smoky pork flavor, just going with caviar, you know? BL: The dishes tonight were direct memories; the hors d’ouvre was a dirty rice arancini. The dirty rice is special to me, and I’ve traveled Italy and I thought, what a great way to translate an Italian dish to something that’s personal to me. And then adding the pimento cheese, that’s something we always had. The oxtail dish, I grew up on braised oxtail. It’s a cheap cut of meat—it was a cheap cut of meat, now all the chefs want to buy it. I wanted to play with it. Usually people think of braised greens but I prefer chard; I grow a lot of Swiss chard at my house. Throwing that pickled chard in there; we always talk about using the whole animal, we need to use the whole vegetable too, in different preparations. TH: It tells all my history. Andouille tells my connection to the South and Creole Louisiana, the gougère is a nod to my French training and the muffuletta is a nod to my love of New Orleans cuisine, but the way I cooked the salmon and the beans is California-influenced but still modern and Southern. It’s what I feel. That’s how I would eat every day if I could. CS: I really wanted to bring my family influence into this. My grandmother both made the biscuits and the scrapple. Never in a million years would she have imagined her recipes would be served at the James Beard House. How does food play a role in telling your story and a culture or people’s story? AC: Cuisine is the best way to tell your story, and it’s the best way to tell your family’s story, your history about where you’re from and where you’re going. It’s kind of what Anthony Bourdain was so good at, showing how much we all have in common in terms of our hopes, our dreams, aspirations, our love for one another and how that all, frequently, revolves around the table. So even if we’re making different food, we all come together over food. And this [dinner] shows that exact same thing, how we may cook the same thing in four different ways and be four different people who’ve interpreted the same dishes differently, but we all came together over this shared love of this cuisine that we were taught by the people that loved us and that we loved the most. BL: Your story is not meant for you; I think that’s the biggest lesson people need to learn. Your story is meant for someone else to hear. I love to share my story and allow somebody else to walk away from that with inspiration. When we talk about celebrating Juneteenth, I think it’s an opportunity to talk about my experience and how I became an entrepreneur and how I’ve gotten to where I’m at. TH: There’s room for all of us; we all have such different stories to tell. 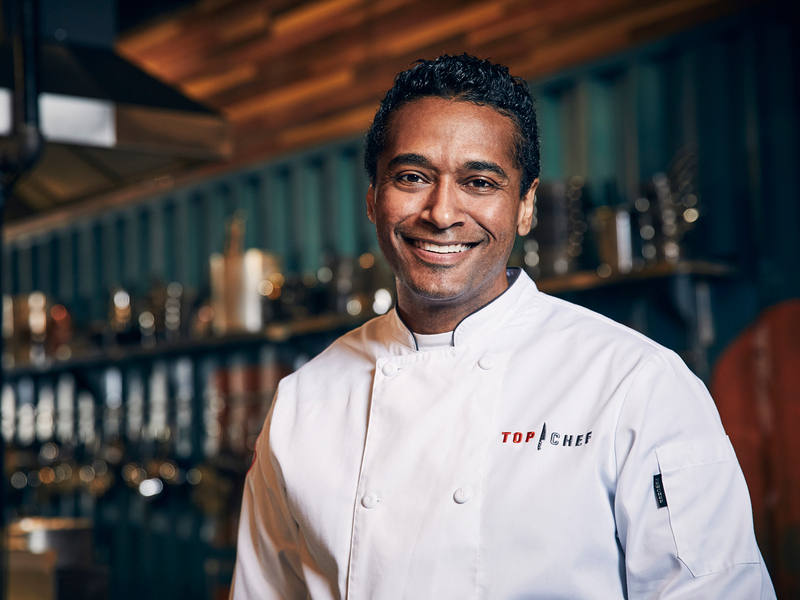 You know, there can be five different Italian chefs and nobody blinks an eye, but often only one African-American chef or one chef of color gets recognized. We’re as diverse as any other cuisine around the world, and this dinner has been a great opportunity to show people that. CS: I remember when I first came onto Top Chef people would be like, “What’s this Amish soul food stuff? Is it a gimmick? It doesn’t make any sense, etc.” But diversity and story comes into it. Soul food is all over the South, but in the Florida Panhandle you have Creole influence all the way to Louisiana, and when you move into the Mississippi Delta, you get Mexican migrant influence in that soul food. And it’s the same thing when you’re coming up north, anywhere from Virginia up to Canada has a lot of German, Dutch, and Amish influence, and because that’s where I grew up, the significance of that blend of cuisine plays such a big role. Even tonight we were discussing the two very different types of cornbread. There’s culturally what we all experience and separately what we each experience. That’s the diversity we’re talking about.